TORONTO, ON – Hong Kong is once again the freest jurisdiction in the world while the United States continues its decline, dropping to 23rd in the Human Freedom Index, released today by the Fraser Institute and a network of international public policy think-tanks. The index – which uses 76 indicators of personal, civil and economic freedoms to rank 159 countries and jurisdictions around the world – includes rankings from 2008 to 2014, the most recent year of comparable data. "The Human Freedom Index measures civil liberties, economic freedom, the rule of law, freedom of movement, women's rights and much more," said Fred McMahon, Dr. Michael A. Walker Research Chair in Economic Freedom at the Fraser Institute and editor of study. Hong Kong again ranks number one, followed by Switzerland, New Zealand, Ireland and Denmark. Canada, the United Kingdom and Australia are tied for sixth. Other notable countries include Germany (13), the U.S. (23), France (31), Japan (32), Russia (115) and China (141). Hong Kong's place atop the list is largely because of its high scores in economic freedom. "While the freedom index doesn't measure democracy, democracy remains the best safeguard of personal freedoms. If China encroaches on its one-country, two-system relationship with Hong Kong, we can expect Hong Kong's ranking to drop," McMahon said. By region, the average rankings on the index were highest for Western and Northern Europe, followed by North America. And they were lowest for South Asia, Sub-Saharan Africa, the Middle East and North Africa. The complete index, a joint project of Canada's Fraser Institute, the Cato Institute in the U.S., and the Liberales Institut of the Friedrich Naumann Foundation for Freedom in Germany, is available as a free PDF download at www.fraserinstitute.org. McMahon is the project editor. Ian Vasquez of the Cato Institute, and Tanja Porcnik of the Visio Institute in Slovenia are the co-authors. QUEZON CITY – SELDA (Samahan ng Ex-Detainees Laban sa Detensyon at Aresto) demanded the Duterte administration the immediate release of 400 political detainees following the death of Bernabe Ocasla, Monday afternoon. “The Duterte administration is accountable for the death of Ocasla, who should have been released along with more than a hundred ailing political detainees as soon as it assumed office. This is the tragic result of the government’s deliberate delays and excuses in the release of political prisoners,” said Fr. Dionito Cabillas, SELDA spokesperson. Selda and other rights groups have been calling for the release of Ocasla, 66, who went into a coma after suffering a heart attack on Friday, November 25. He has been languishing in jail for seven years, and was detained at the Manila City Jail on trumped-up charges of 15 counts of multiple murder. Calls for the immediate release of more than a hundred political prisoners who are ailing and elderly on humanitarian grounds is continuously denied by the government. He is one of the co-accused of NDFP peace consultants Benito Tiamzon, Wilma Tiamzon, Randall Echanis, Rafael Baylosis, Vicente Ladlad, and Adelberto Silva on trumped up charges of multiple murder cases filed by the Armed Forces of the Philippines pending before Manila Regional Trial Court Branch 32. “Ocasla just came from his court hearing the day before he suffered a heart attack, optimistic and hopeful for their freedom. He, however, is a ticking time bomb since, with his hypertension and partial blindness. There are more Bernabe Ocaslas who are suffering inside detention centers. Their health conditions are rapidly deteriorating for lack of proper medical attention and subhuman jail conditions. Most importantly, they should not be in jail in the first place,” said Cabillas. More than one-thirds of the 400 political prisoners are sick, a number of them are already old. In previous years, political prisoners like Alison Alcantara, Benny Barid and Eduardo Serrano died while under the custody of the state. Serrano, who died last January, would have been one of the released NDFP consultants this year, after formal peace talks between the GRP and the NDFP resumed in July. Office of the Presidential Adviser on the Peace Process Secretary Jesus Dureza and GRP panel chairman Secretary Silvestre Bello III have been announcing the release of political prisoners since they assumed office. “Sec. Dureza even has the gall to say they’ve released 70 political prisoners while those with life-threatening illnesses like Ocasla gamble with death. This is far from truth. We don’t need their empty grandstanding, what we demand is the release of all political prisoners, alive and granted amnesty. Release the 400! Amnesty now!” said Cabillas. QUEZON CITY – Big labor group Associated Labor Unions (ALU) is calling for convergence between local government units, national government agencies, industry players and workers to developed the firecracker and pyrotechnic manufacturing rather than shut the entire industry in the country. “We are urging the government not to destroy the entire industry. What the industry workers and businesses needs now is help and support from the national and local government for them to evolve, modernize and flourish. Life and property destructions can be averted or greatly minimized if the available new and safe technologies are infused into the industry,” said Alan Tanjusay, ALU spokesperson. He said the local government units or the government agencies such as the Department of Trade and Industry (DTI), Department of Labor and Employment (DOLE) and Department of Science and Technology (DOST) to call for a summit and lead stakeholders in discussing ways toward modernizing. The summit could also be a forum for the introduction of more stringent and consistent application of safety and health regulation in the manufacturing, selling and use of firecrackers and pyrotechnics. The labor group made the proposition amid a work stoppage order issued by the DOLE after a factory blast happened in Sta. Maria, Bulacan Wednesday killing three persons and left several others injured. “If the government suppress the industry, thousands of workers and their families will suffer. Besides, if the industry is banned unsafe firecrackers and unregulated pyrotechnics from foreign countries will be smuggled and proliferate anyway. So rather than destroy, why not develop and make it thrive,” Tanjusay said. He estimated there are around 400,000 workers, employers, retailers and allied industry workers are dependent in the industry. 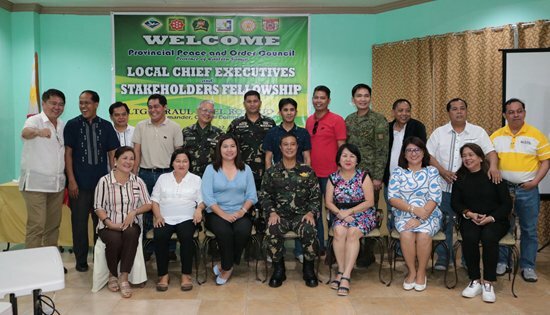 CAMP LUKBAN, Catbalogan City – The Army in Eastern Visayas joined in the Provincial Peace and Order Council Meeting with the local chief executives and stakeholders of the whole province of Eastern Samar with Lieut. Gen. Raul L Del Rosario AFP, Commander Central Command, AFP held at Doña Vicente Hotel, Borongan, Eastern Samar on November 22, 2016. The activity aims to unite the Local Chief Executives and stakeholders towards progression and addressing the poverty problems of the province. Further, it also advocates President Rodrigo Roa Duterte’s thrust against illegal drugs and other lawless violence that arises in the province. The meeting was called to order by the PPOC Chairman, Hon. Marcelo Ferdinand A. Picardal, Vice-Governor of Eastern Samar. Present during the activity are: Lieut Gen Raul L Del Rosario AFP, Commander Central Command; Brig Gen Raul M Farnacio AFP, Commander 8ID; PSSupt Tranquilino A Araral, PD, ESPPO; Mr Virgilio Capon, Provincial Administrator representing Governor Conrado B Nicart Jr; Hon. Marcelino Ferdinand A Picardal, Vice-Governor and mayors of 1 city and 19 municipalities of Eastern Samar; Rev. Fr. Leroy Geli, Rector, College of Seminary, Our Lady of Nativity; and members of Provincial Peace and Order Council of Eastern Samar. During the activity, the Local Chief Executives were given a time to present their actual situation especially in the far flung areas. Accordingly, the CPP-NPA movement affects the peace and order that hinders the progression of their municipalities especially on the delivery of basic services. Brig Gen Raul M Farnacio AFP emphasized that through the assistance from the Local Chief Executives in addressing the needs of the people is the key to win their trust. “Kailangan nating magkaisa at ibigay kung ano ang kelangan ng ating mga mahihirap na kababayan. Problema sa lupa at kahirapan ang hinaing ng ating mga kababayan. Kaming mga kasundaluhan ay handing tumulong sa inyo para puntahan ang mga malalayong barangay na mas nangangailan ng inyong serbisyo”, Farnacio added. Also, Lieut Gen Raul L Del Rosario AFP said in his message, “Natutuwa ako at nag-open up ang ating mga LGUs, you really presented the situation base on the briefing or reactions and I believe we have identified some problem areas. I hope that from CENTCOM view ay talagang pursigihin natin ito hanggat hindi natin makamit yung lasting peace na talagang deserve nating lahat para umunlad na ang ating Bansang Pilipinas,” Del Rosario added. 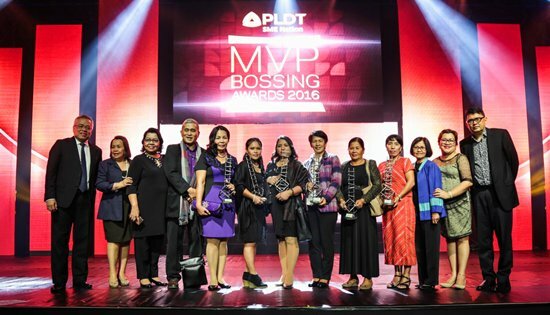 TAGUIG CITY – DTI’s shared service facilities (SSF) beneficiaries on coffee processing, native bag making, and fiber marketing were the recipients of the first-ever Kapatid Awards at PLDT’s MVP Bossing Awards 2016 on November 23. SSFs on coffee processing from Mountain Province, Cordillera Administrative Region (CAR), on pandan and bariw bag making from Leyte, Region VIII and on fiber marketing expansion from Agusan del Norte, CARAGA received awards for exhibiting sustainable and inclusive growth models that contribute to the improvement of the quality of lives in said communities. Receiving the awards were representatives from SSF cooperators Dangdang-ay di Ibila Cooperative from CAR, Sto. Niño de Plaridel Parish Multi-Purpose Cooperative from Region VIII and San Isidro Upland Farmers Multi-purpose Cooperative from CARAGA. The SSF Project is a key component of the Department of Trade and Industry (DTI)'s initiative to capacitate micro, small and medium enterprises (MSMEs) by providing them appropriate machinery, equipment, tools, systems, skills and knowledge under a shared system. As backbone of the Philippine economic growth, composed of 99.6% of locally registered businesses, generating over one million job a year, MSMEs have become the government’s current priority, with the DTI placing MSME development at the forefront of regional development and at the front and center of the trade agenda. “Aside from keeping the country moving towards a more strategic direction at the backdrop of regional development, the government, through the DTI, vows to pursue meaningful growth that is truly inclusive, the one that reaches the bottom of the pyramid,” said DTI Secretary Ramon Lopez, who was also one of the recipient of the MVP Bossing Awards in government service. DTI’s thrust towards MSME development is anchored on President Rodrigo Duterte’s 10-point socio-economic agenda to attain a quality of growth that will result in shared prosperity among Filipinos, according to the trade chief. As of October 2016, a total of 2,099 SSFs have already been established across the country. In partnership with Go Negosyo and DTI, the Kapatid Awards is an offshoot of the Kapatid Program, which has advocated MSME development through training and partnering with big businesses to mainstream and integrate MSMEs and their products and services into the bigger value chains. “Across the country, there are already successful micro, small and medium scale players who, even in advance of the Government’s call, have created sustainable growth models that bring employment to the sectors of society that need it,” PLDT Vice President Mitch Locsin was quoted in a statement. 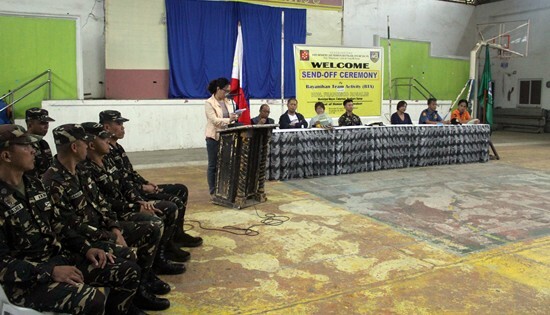 CAMP LUKBAN, Catbalogan City – The Army in Eastern Visayas headed by Brig Gen Raul M Farnacio AFP, intensifies its Internal Peace Security Plan “Bayanihan” that encourages all the Government Agencies and Non-Government Organizations in working together to end up the socio-economic problems of this region. 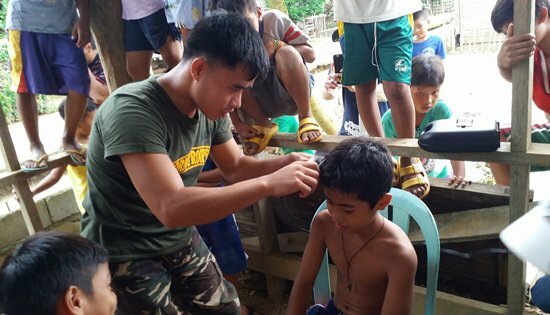 One of these efforts was the 3-day Bayanihan activity from November 7-9, 2016 conducted by the 14th Infantry (Avenger) Battalion in the barangays of Agsaman, Poblacion, and Cagmanaba, all of Jipapad, Eastern Samar in partnership with the AGAPE Rural Health Program, that delivers basic services such as medical/dental assistance, free medicines, free hair-cuts, film viewing and distribution of slippers, clothes, and reading glasses. AGAPE is a Non-Government Organization composed of Christian volunteers from Asia and US whose mission is to help the less fortunate that cannot afford to sustain their medications and basic needs. As a result of the activity, the people of Jipapad benefited from a total of 1,078 medical check-ups with free medicines, 78 tooth-extractions, 30 hair-cuts, 330 reading glasses, and 340 pairs of slipper. In ensuring the safety of the volunteers of AGAPE, the Avenger Battalion served as their security all throughout the activity. The security effort of the troops was not made against the CPP-NPA but rather to prevent any lawlessness violence that may arise in the area during the activity. “This is the time to be united in our desire of addressing the poverty problem of the region. Let’s help together in building a peaceful and developed Eastern Visayas“, Farnacio added. MANILA – The Philippine government should hold accountable members of law enforcement agencies implicated in the extrajudicial killings of civilians in its “war on drugs,” the newly formed Network Against Killings in the Philippines (NAKPhilippines) said today. At the same time, the Duterte administration should thoroughly and credibly investigate the thousands of summary killings attributed to unidentified gunmen since June 30, 2016. Since the start of Duterte’s war on drugs, not a single law enforcer has been brought to court to answer allegations of extrajudicial executions during so-called “legitimate police operations.” “What the police and President Duterte himself have done is to defend the actions of police officers involved in these operations even though a credible investigation has yet to take place. We fear not only a lack of accountability but possible government cover-up for these crimes,” said Father Amado Picardal, one of the group’s convenors who also serves as its spokesperson. The government has likewise failed to launch any meaningful investigation into the more than 3,000 so-called “death under investigation” killings, indicating a serious failure to fulfill its responsibility and duty to investigate crimes – particularly crimes of this brutal nature with no semblance of due process – and bring the perpetrators to justice. “The Duterte administration’s failure to investigate these summary killings is a serious lapse in its human rights commitment but at the same time also indicates complicity in these atrocities,” Father Picardal said. NAKPhilippines said the administration of President Duterte has not only made the human rights situation in the Philippines worse – it has brought it to a whole new and more dangerous level as the killings in its war on drugs continue. “It is time for these killings to stop and for the killers to be brought to justice,” it said. Unlike previous administrations that have denied complicity in past extrajudicial killings, the Duterte government “encourages these abuses and even promises protection to the perpetrators, taking an already egregious human rights situation to a whole new and more dangerous level,” it said. In the first five months of the Duterte administration, nearly 5,000 people have been killed in its brutal war on drugs, with the police saying that more than 2,000 of that died in police operations while the rest were killed by unidentified assailants, what the police calls “deaths under investigations” that appear to be death squad killings. A number of children were among those killed. NAKPhilippines will hold its launching activity on Nov. 23, which is also the 7th anniversary of the Ampatuan Massacre. It will hold a “National Day of Prayer and Solidarity for Victims of Extrajudicial Killings and Their Families” through a Mass to be celebrated by Bishop Broderick Pabillo at 4:45 PM at the Shrine of Mother Perpetual Help, Redemptorist Church in Baclaran, Manila. Families of victims of the drug have been invited to attend the Mass and the solidarity activities that will follow. Convenors and supporters of NAKPhilippines will also be present. A press conference by Bishop Pabillo and the group’s representatives will also be held at the Sinirangan Café inside the church compound. The group’s launching statement is supported and endorsed by several groups from the Philippines and abroad, among them the Asian Human Rights Commission (Hongkong), Bahay Tuluyan (Philippines), Bawgbug Advocates for Peace and Human Rights (Philippines), Coalition Against Summary Execution (Philippines), Cross Cultural Foundation (Thailand), Human Rights Watch (USA), Human Rights Office (Sri Lanka), Jagaran Media Center (Nepal), Justice and Peace Commission of the HK Catholic Diocese (Hong Kong), Katilingbanong Pagtambayayong (Philippines), LBH Padang (Legal Aid) (Indonesia), Mindanao Peoples Caucus (Philippines), Sentro (Philippines), Terai Human Rights Defenders Alliance (Nepal), Interfaith Cooperation Forum in Hong Kong (Hong Kong), Janasansadaya - Panadura (Sri lanka), Conectas Human Rights (Brazil), Community Development Foundation Pakistan (Pakistan), Centre for War Victims and Human Rights (Canada), Odhikar (Bangladesh), and Sedane Labour Resource Center (Indonesia). Dozens of individuals have also signed up and the group expects more in the coming days. Bayanihan Team Activity (BTA) send-off ceremony - first time in Catarman, LGU ready to support! LOPE DE VEGA, Northern, Samar – The Local Government Unit of Catarman, Northern Samar together with the 43rd Infantry (We Search) Battalion, 8th Infantry (Stormtroopers) Division, Philippine Army and other stakeholders conducted Send-Off Ceremony of Bayanihan Team Activity (BTA) on November 18, 2016, 9:00 o’clock in the morning at the Municipal Gymnasium. Some Guests from other stakeholders such as the Philippine National Police, Department of Agrarian Reform, Department of Agriculture, Department of Environment and Natural Resources and Department of Labor and Employment participated and witnessed the send-off of the BTA operators. Moreover, the two (2) barangay captains from Brgy. Quezon and Brgy. McKinley, both of Catarman, Northern Samar where the BTA Team will be deployed also attended the send-off ceremony. The activity was designed to show to the people that the Bayanihan Team Activity is not a military activity alone, but it is a convergence of effort from other agencies of the government as stated in the IPSP “Bayanihan” wherein other stakeholders are involved from planning, implementation and evaluation phase. Major Edgar A Gabia (INF) PA, officer-in-charge, 43rd IB said: “This activity will remind everyone that IPSP “Bayanihan” is a convergence of efforts to WIN the PEACE from other stakeholders or line agencies of the government, wherein the efforts are geared towards convincing the CPP-NPA-NDF to abandon the armed struggle and engage in Peace Talks/negotiations.” He also encouraged the other line agencies specially the LGUs to do their share and give their whole hearted support for the successful conduct of the Bayanihan Team Activity”. Executive Assistant Arielyn L. Fernandez also said that: “In the absence of Mayor Franciso Rosales, I am representing on his behalf, pinapasabi ni Mayor na ang LGU ay handang tumulong at sumuporta sa mga gagawin ng mga BTA operators sa mga barangay na pupuntahan nila para maipaabot din ang programa namin”. “Actually, this is the first time na nagkaroon ng ganitong activity dito sa Catarman, on behalf of the Office of the Mayor, we express our thanks to the 43rd IB who exerted the effort to make this event become successful, and we hope that through them, the people of Brgy. Quezon and McKinley will be enlightened and stop their support and alliance with the NPA so that the said barangays will become more progressive and well developed.” Fernandez added.